Description: THIS IS FOR THE GUY THAT LIKES TO ATTRACT ATTENTION AT THE RANGE, 100% FAKE SOUND SUPPRESSOR.... NO SOUND SUPPRESSING CAPABILITY AT ALL, THEY ARE 7" LONG X 1 3/8" WIDE THEY ARE NOT THREADED INSIDE. AT THE ATTACHING END IT HAS A DIA. OF (.595 -.597 ) A LITTLE OVER 9/16" OR 19/32", THERE IS A PLATFORM INSIDE WHERE YOU WILL START YOUR THREADS, IT STARTS AT 3 5/8" DEEP,AT THE PLATFORM WHERE YOU WOULD START YOUR THREADS IT STEP'S DOWN TO 7/16" , AND CONTINUES THROUGH THE OTHER END AT THAT DIA. 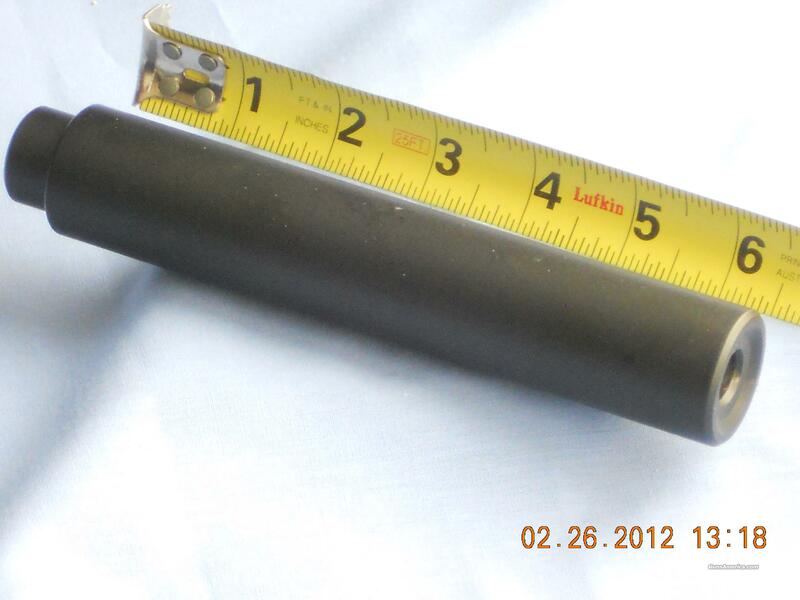 it is made of aluminum, and has a weight of less than 3/4 lb. AS YOU MAY HAVE FIGURED OUT BY NOW THESE ARE NOT THREADED WHICH ALLOWS YOU TO MAKE IT FIT ALMOST ANY THING YOU DESIRE.